The new generation RDS Artemis drill control system is a variable rate control and monitoring system for seed drills. The system removes the need for a mechanically driven landwheel by operating the metering unit with an electric motor maintaining its speed proportional to forward speed, or adjusting sowing rates to suit the mapping provided by the precision farming option if this is utilised. The iSOCAN Artemis system can run four motors/products i.e. seed/fert or seed/fert/slug pellets with each motor being able to run up to two accord type metering units of the same type i.e. seed/seed and fert/fert, tube blockage sensors and two bin mounted cameras all from the same screen. 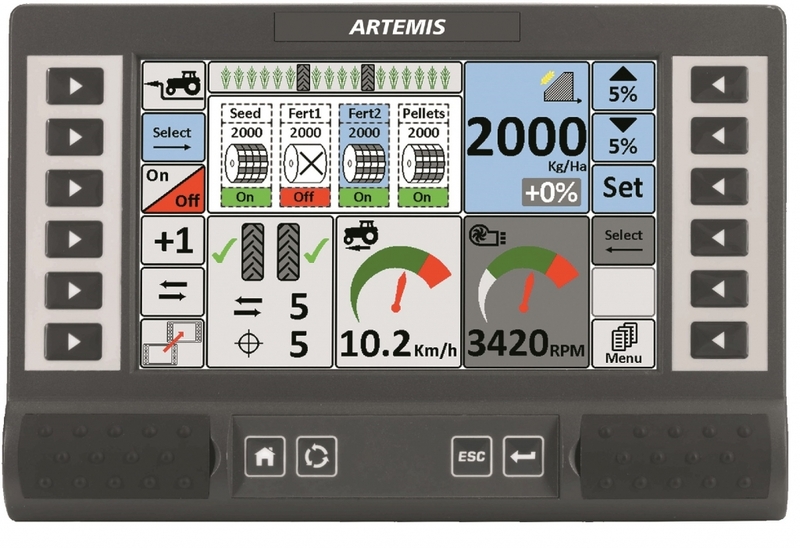 The iSOCAN Artemis system has the ability to work on ISOBUS ISO-compliant Universal Terminals, reducing the number of screens in the tractor cab. Simple & fast operator product calibration – press Motor Priming Button, dispense product into a container, weigh and enter actual weight into the instrument. Rate Adjustment 'on the move' - when application rates require changing, utilise the manual adjustment buttons. Precision Farming capability – add an appropriate GPS receiver and load a pre-defined seeding plan for automated variable seed rate application.